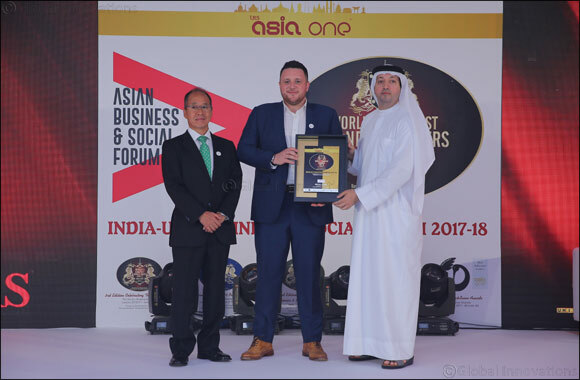 Dubai, UAE, May 27, 2018: Shuraa bestowed with World’s Greatest Brands & Leaders Asia & GCC 2017-18 award at India UAE Business & Social Forum 2018. The award and business summit organized jointly by URS Media Consulting PL and AsiaOne magazine was recently held at J W Marriot Marquis Dubai. The award was presented by H.E.Saud Salim Al Mazrouei, Director, Hamriya Free Zone Authority & Sharjah Airport International Free Zone in the presence of H.E.Dr. Akima Umezawa, The Consul General of Japan in Dubai to Michael Gillies, Director- Operations, Shuraa Business Setup. The award was bestowed after an extensive research by the United Research Services. The evaluation was performed by the editorial team of URS media in coordination with the audit firm Price Waterhouse Coopers, reviewing and validating the process. It is a well-known fact that Shuraa is a leading one-stop solution provider for all those who intend to set up their business in the UAE. “Our service range is quite comprehensive. We offer a wide range of services and complete business set-up packages, right from establishment all the way through to the necessary post business set-up activities. The services include business setup in Dubai, business licensing & registration, sourcing office space, PRO services in Dubai, visas for the investor as well as the employees, Company formation in Dubai, and opening of corporate bank accounts. We also provide the required guidance and assistance for setting up companies in the various Free Zones, across the UAE. To operate a business in UAE, every company must first be issued a Business (Trade) License. We also assist in this process – be it a Professional, Commercial or Industrial Trade License. After the business setup, every organisation requires additional services, whether it be applying for document clearance, immigration cards, visas, licenses, insurance etc. Shuraa offers quality PRO services to allow organisations to concentrate on their core competencies. Shuraa also offers monthly or yearly services for companies seeking to develop and maintain links with government and non-government agencies all over the UAE,” he added. Michael Gillies,, expressed his happiness in receiving the award. “We are known for our proactive business approach. This award is a strong testimony to the far-sighted vision of our Founder Mr. Saeed Khalifa Mohammed Al Fuqaei“.